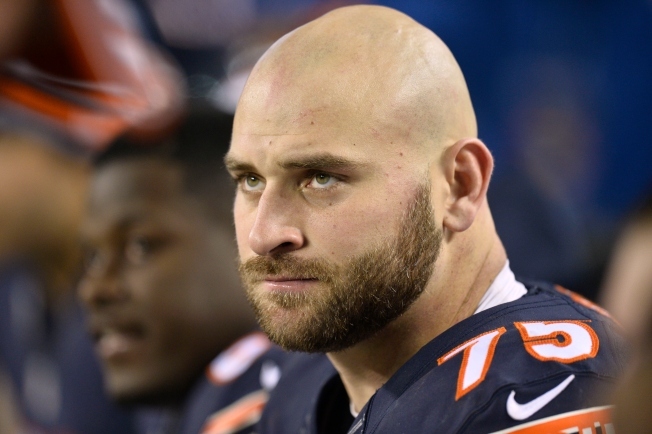 The Chicago Bears haven’t had a lot to be happy about this season, but one of their best stories of the year was recognized on Tuesday as right guard Kyle Long was named to his second consecutive Pro Bowl. Long, who was drafted in the first round of the 2013 NFL Draft out of the University of Oregon, is the first Bears player to make the Pro Bowl in each of his first two seasons in the league since Devin Hester accomplished the feat in 2006 and 2007. The second-year guard has had a ton of success so far this season, starting 14 of the team’s 15 games and not allowing a sack yet on the year according to Stats Inc.
Long’s best game of the season without question was his performance against the Detroit Lions on Thanksgiving. The Bears’ offense looked great in the early going of that contest, and throughout the afternoon Long kept All-Pro defensive tackle N’Damukong Suh out of the Bears’ backfield. There is some question among media members why Long hasn’t been moved to the tackle position this season, with his athleticism and injuries to both Jermon Bushrod and Jordan Mills marring the season or Chicago. With his results at guard however, one can forgive Marc Trestman and Aaron Kromer for their hesitancy to pull the trigger on the move.